photo-eye | BLOG: Book Review: Ext.-Int. Book Review Ext.-Int. By Raimond Wouda Reviewed by Adam Bell Film sets can be incredibly boring places. Long stretches of inactivity are punctuated with moments of frenetic activity. In my short career as a still-photographer, I worked on a total of four films before tiring of the poor pay and long, long hours. Always secondary to the task at hand, the still photographer is constantly in the way; the AD yells at you to move while the producer urges you to go back in and get the shot. 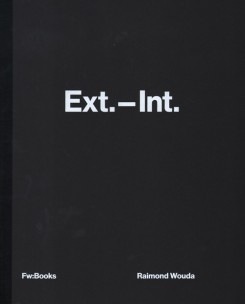 Ext.-Int.. By Raimond Wouda. Fw, 2015. Fw, Amsterdam, The Netherlands, 2015. In English. 160 pp., color illustrations, 9½x11¾". Film sets can be incredibly boring places. Long stretches of inactivity are punctuated with moments of frenetic activity. In my short career as a still-photographer, I worked on a total of four films before tiring of the poor pay and long, long hours. Always secondary to the task at hand, the still photographer is constantly in the way; the AD yells at you to move while the producer urges you to go back in and get the shot. Despite the tedium of a film set, there are moments of luminous beauty. When the lights are set, when the stage is empty and about to be filled, the world waiting to be framed and filmed is transformed. Raimond Wouda first worked as a still-photographer years ago, but recently returned to document the strange rituals, quiet moments, and elaborately staged dramas that unfolded on small Dutch-language film productions in the Netherlands and Belgium. Alternating between arresting portraits of extras, still-lifes, and expansive shots of the often brightly lit stages, Ext.-Int. resembles a script supervisor’s luxuriously illustrated and annotated scrapbook. Despite the often humble illusions and stages it documents, the book reveals a world constantly on the edge of transformation, moving in and out of fantasy, fighting its humble surroundings, waiting for a frame to direct our attention and make the mundane world drop away. Wouda’s large-format color images alternate between shots of film-ready scenes, peripheral views, and quiet moments taken off set of actors or equipment. As the book’s title suggests, Wouda moves between both exteriors and interiors for each scene, but he also moves in and out of the film set, looking out and looking in. The productions he’s chosen are mostly humble, small-budget affairs. While there is often fog, smoke and costumes, they lack the outsized drama of Hollywood blockbuster productions. That doesn’t mean they do not forgo illusion or fantasy. In one image, taken on the set of Alfie the Little Werewolf / Dolfje Weerwolfje (2011), a large light orb, standing in for the moon, is held aloft by a crane over a tranquil city park. In the preceding image, we see Alfie, or perhaps his dad, a man in a crude werewolf outfit sitting impatiently at a table, waiting to be called to the set. In Wolf (Bilthoven, The Netherlands), we see a small makeshift craft services table, tucked away in a room full of books and office binders — a testament to the shoe-string budget of the corresponding film. When applicable, each image is labeled with both the scene number from the movie and page where the scene appears in the screenplay. With the exception of the werewolf and a few costumed extras, the drama and fantasy is often understated. The actors, like the scenes, hover between fantasy and reality — offering hints of the roles they’re playing, while never really hiding who they are in real life. The book also comes with an added multi-media component. In the rear section of the book labeled Screenplay, small versions of the images can be scanned using the Layar app to view short, corresponding film clips of the scene from the movie. Although I initially had trouble getting this component to work, after trying several times I finally got the clips to run. While it’s unclear how long this feature will continue to function, the book succeeds admirably without this additional feature and it’s a smart way to incorporate moving images into the book. Along with the thumbnails, each image is accompanied by a small excerpt from the movie’s script, an addendum that makes the book resemble a script supervisor’s scrapbook. Charged with keeping track of all the shots, dialogue, and checking for continuity between all the takes, the script supervisor makes sure the crew doesn’t miss anything. In a sense, Wouda’s concluding section allows us to dive more deeply into the mute still images, read what the actors are really saying and gain a sense of the overall drama. The design of Ext.-Int. makes smart use of the source material without any undue gimmicks. From the caption text treatment to the rear sections, enormous attention has been paid to the various components of the book and it pays off. This book could have easily been a drab affair, but is given life with the intelligent design. In a nice touch, the simple black front and back covers resemble a bootleg script you might buy off the streets of New York City. Even the incorporation of the Layar app feels seamless and is not overstated.